MAC 205 Mascara Fan Brush Review: An Ode to Mascara Fan Brushes and why you need one. Why Use a Mascara Fan Brush? A mascara fan brush seems like an unnecessary product since mascara generally comes with its own wand and lash tools exist to comb out clumps. I felt this way until I used a mascara fan brush myself. Here is why I love my MAC 205 mascara fan brush. wet mascara but often these formulations are heavy and weigh lashes down too much to hold a good curl. They often are messy and clumpy on application and can flake. So many mascaras I LOVE upon application like Fairy Drops Scandal Queen, Calvin Klein CK One, Hot Lashes Mascara, Dior DiorShow, even Benefit BadGal are SO dark and lovely and give my lashes OOMPH, but I must apply them too heavy handedly because my mascara looks way too obvious and fake no matter how much I clean off the wand before application. I like a thick lush lash, but somewhat natural looking. Or at least not multi-lash stuck together clumpy disasters. While lash tools and combs are useful, they rarely give even application of mascara, and generally cannot create the look of individual lashes, combs generally leave at least some lashes stuck together. 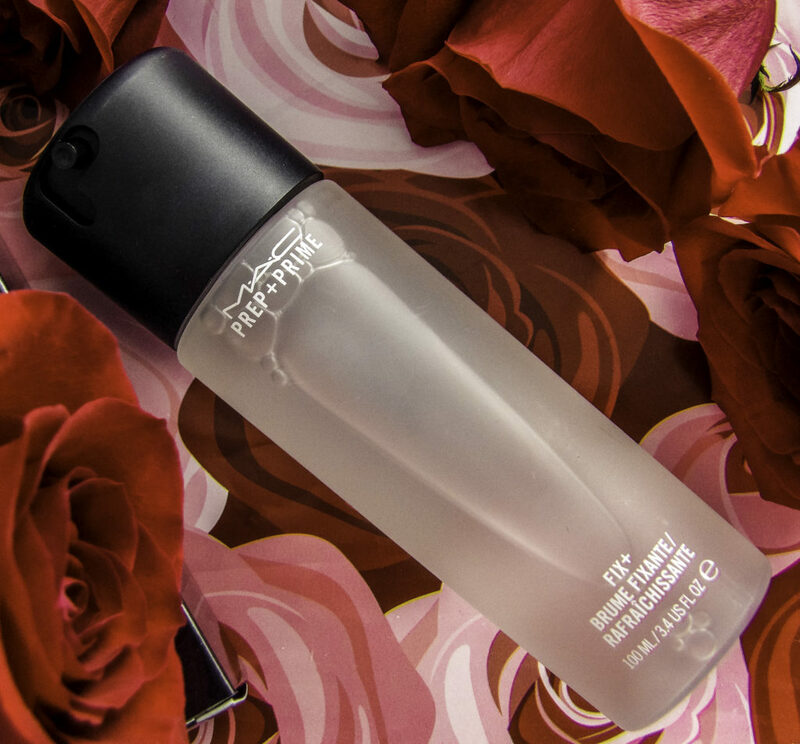 SOLUTION: To solve this beauty dilemma, use a Mascara Fan Brush to de-clump and apply these lovely dark, thick, wet mascaras smoothly and clump-free for wispy, fluttery, long, dark THICK lashes – even coat the tiny lash. There is a range of mascara fan brushes on the market from a basic drugstore beauty chain store fan brush to the $65 Barney’s Claudio Riaz Lash Touch Brush. A good quality mascara fan brush is the MAC 205 Mascara Fan Brush for $20. Mascara Fan Brushes can individually “paint” and coat each tiny or long lash separately for AMAZING definition of your lashline. Each lash stands out with no clumping yet appears naturally dark and long and thick. for all day, clump-free lashes that do not require touch-ups. 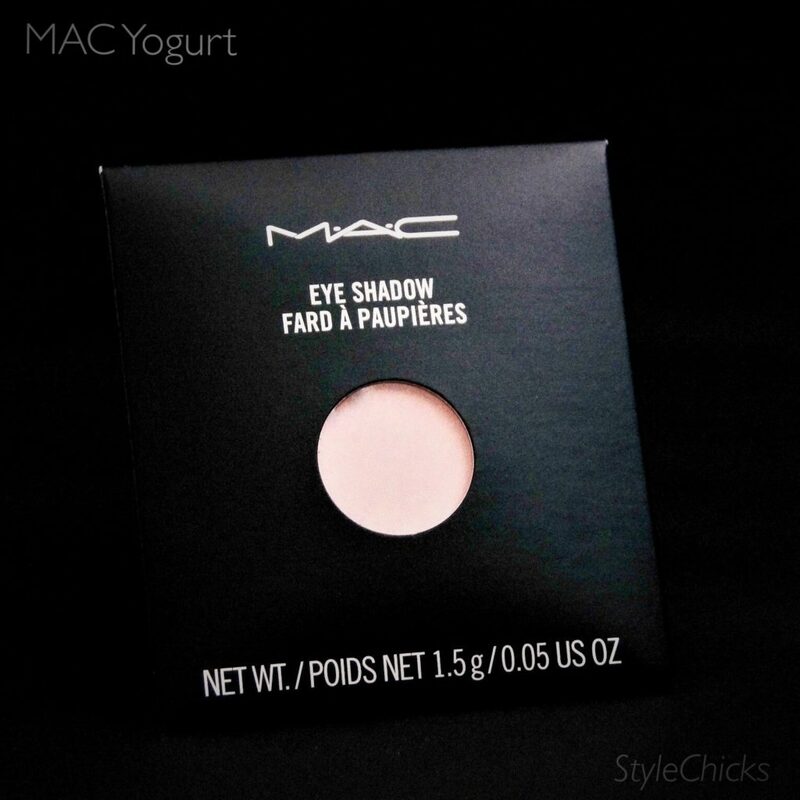 Easier for those with the steady hands of a true makeup artist than a regular makeup fanatic like myself to use. But a little practice went a long way and now I can always get a good application the first time, which reduces the time I spend declumping and combing excess mascara upon application (but keep q-tips at the ready) and reduces how much reapplication or clean-up of mascara I do when touching up my makeup. Notice the longer and shorter bristle lengths in the photo to the right. 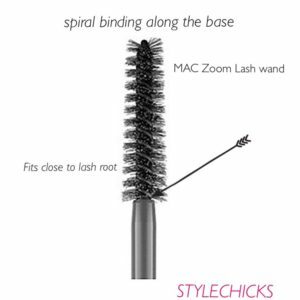 When using the MAC 205, try to load the mascara onto the shorter fan bristles, not the longer guard bristles. Do this by bending and holding the longer guard bristles away from the shorter bristles with your finger while only coating the short bristles with mascara. This way, you can apply the mascara with the short bristles and comb out clumps and direct the lashes with the longer bristles. Mascara Fan Brushes take a bit to get used to, mostly how to wiggle it into your lash line without being too heavy-handed to spread the product evenly. But once you get the technique down, it lasts for the day without touchups and goes much faster than traditional wand application and de-clumping. 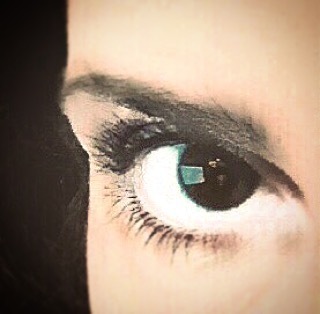 In the photo seen above, this was Calvin Klein CK One Mascara, a thick black mascara that stays put but is too heavy to apply directly from the tube. In this photo, I did a quick running-out-the-door-I-am-late, 30 seconds for both eyes, didn’t have to de-clump much (although I see one clumpy spot on my lower lashes I could have fixed) and I didn’t have to reapply at all during a 13 hour day. No real flaking during the day either or undereye cleanup. 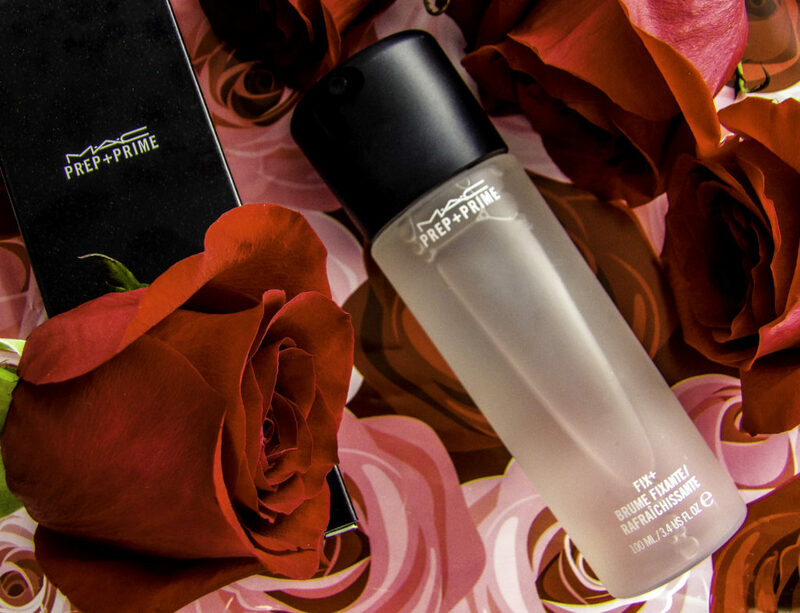 While the Mac Mascara fan brush can do a perfect application within a few minutes, this photo is a realistic every day quick use of a THICK BLACK mascara applied with the brush with some practice. Comb through your lashes with a clean lash brush spoolie or lash comb, especially if you have curly lashes or flat lying lashes. Curl lashes now if desired. Sweep the wand of your favorite over-the-top wet, dark mascara against the tip of your mascara fan brush to deposit enough mascara for one eye. Brush away any obvious clumps. Start with less than you think you need, you can always add more. Begin with your upper lashes and lightly touch the fan bristles horizontally to the center of the root lash line, depositing some product. Then wiggle it into the lash root and comb through in one stroke, gently pushing that color out along the length of the lashes, taking your time, lightly painting your lashes up and out. Comb through with a clean spoolie if you use too much product or have any lashes stuck together. You can also separate lashes any stuck together wiggling the brush vertically as well. Check your upper lashes for any clumps or stuck lashes, use a spoolie if needed or lash brush. If mascara got on the waterline unintentionally, clean up with a q-tip. BEGINNER’S TIP: If you do not have a steady hand, hold the fan brush bristles close to the lash base, and slowly blink your lashes over and through the bristles to paint on the product. Use the apply-to-root technique described above, then wiggle it into the lash root and comb through in one stroke. Comb outside lashes outward, comb middle lashes straight down, and comb the inner lashes inward for the most natural, doe-eyed look. Clean off the fan and do a quick final comb through for any clumps from underneath the lashes. Assess if you want another coat. Clean your brush immediately (or at least later that day), because it will get stuck and gunky quickly. The most popular mascara fan brushes are both around $20. These are the Mac 205 Mascara Fan Brush, and the Paula Dorf Perfect Mascara Fan Brush. The Paula Dorf is one of my favorites because it is the widest and longest, the right combo of soft enough to maneuver around lashes while stiff enough to “paint” and the easiest to wield. Found mostly on eBay. Easier for those with the steady hands of a true makeup artist than a regular makeup fanatic like myself to use. But a little practice went a long way. When using the MAC 205, try to load the mascara onto the shorter fan bristles, not the longer guard bristles. Do this by bending and holding the longer guard bristles away from the shorter bristles with your finger while only coating the short bristles with mascara. 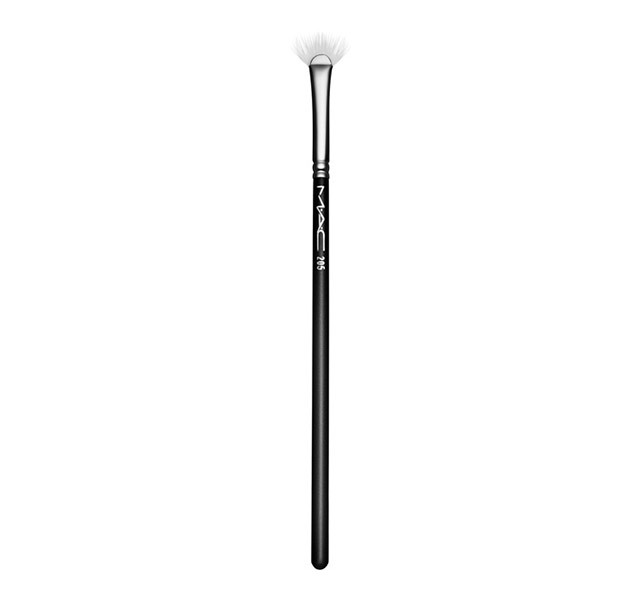 The Mac Cosmetics 205 Mascara Fan Brush is generally available at Mac, $20. SEPHORA COLLECTION: Pro Lash Fan #34, $21. Not very fan-like, but quality bristles, good shape for a beginner to load mascara onto the lash, doesn’t have the ability to create wispy lashes like the Paula Dorf, Claudio Riaz or Mac 205. But, this brush can do cream and cake mascara much easier than the other fan brushes. Surprisingly, there was only one kind of Mascara Fan brush at Sephora at this time. That seems weird. Does anyone else think that is weird? 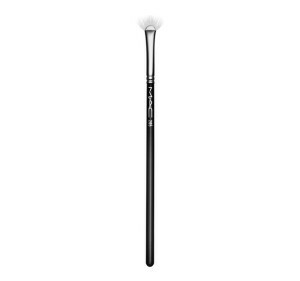 Claudio Riaz Lash Touch Brush, at Barney’s, for $65. The Mercedes Benz/Rolls Royce/Jaguar of Mascara Fan Brushes. A bit steep, but a VERY good brush with nice heft and ease of handling, which is good for klutzes like myself. Nice width to the fan which covers about half the lash line. Bristles are high quality and easy to work with, easy to get fluttery, wispy lashes with this one. I could argue buying a cheaper mascara or not being loyal to any one mascara or in a mascara emergency, using a drugstore brand (gasp!) and still getting a nice high-end look with the ease of use on getting a nice, clump-free look with this brush. Easier to de-clump with, harder to get “wispy” lashes. Ben Nye also makes a Mascara fan brush, it is around $8, haven’t tried it yet. So far, I have not found a drugstore/beauty chain store version of a Mascara fan brush that I like. Most are too stiff to apply mascara or to wiggle it into the root of the lash line, and it is not really a fan shape, more like an eyeliner push brush. For this reason we cannot recommend the Bdellium Tools Makeup Cosmetic Beauty Brush Travel Line – Mascara Fan Brush 731. Most drugstore and beauty supply store fan brushes seemed a variant of this overly rigid push liner brush style, but I would be happy to find a good basic mascara fan brush if anyone knows of a good one.